These words are not mine, but those of a prominent member of the wine industry, and represent the culmination of a long and arduous research into the South African wine industry. The South African wine industry contributes 36 Billion Rands ($ 2,5 Billion) to the South African national budget. It has seen booming exports in recent years, especially to Scandinavia, where the rise in imports of South African wine has increased by 78 % in Denmark alone in just ten years. In Sweden, South African wine has been the second or third most selling wines for years, often outselling French wine. Annually, we Scandinavians drink more than 50 million liters of wine. But despite this apparent success, it has also been an industry that has had something to hide for many years. So perhaps South Africans needed a foreign journalist to show them just how bad it is. It is not as if the South African wine industry hasn’t been warned, though. In 2011, Human Rights Watch published the report, ”Ripe with abuse,” that focused on the same issues that my film dealt with, and four years later, the ILO published an equally damning report. Both reports addressed serious critique in regard to the working and living conditions of South African farm workers. Several local and foreign NGO’s and unions have addressed the same issues. Somehow – and I honestly don’t understand this – these reports failed to make headlines in Scandinavia and South Africa. Starting in December 2015, my crew and I went to Western Cape a total of three times, filming, interviewing, trespassing and allegedly asking ”(…) unethical questions to workers and changing the angle to a negative”, as a so-called ”heads up”-warning to 133 stakeholders in the industry put it on the day we arrived on our last journey to South Africa in June/July 2016. We were commissioned by three Scandinavian public service broadcasters in Denmark, Sweden and Norway, and also partly funded by the Danish Ministry of Foreign Affairs through the Danish international development agency, DANIDA. This was just one of many mails we obtained, following a final meeting with two top-executives from the wine industry. A meeting that was ultimately fruitless, as all the involved farm owners and their industry bodies refused to be interviewed on camera and tell us openly and frankly that we were wrong. They even refused to shake our hands in parting, instead sending us off with the words, ”you are a disgusting piece of rubbish”. After a couple of months of editing, the documentary was aired in Sweden and Denmark on the 19th and 20th of October respectively, and in Norway on the 1st of November 2016. This was when the metaphorical explosion began, and conditions in the South African wine industry suddenly began making headlines around the world. 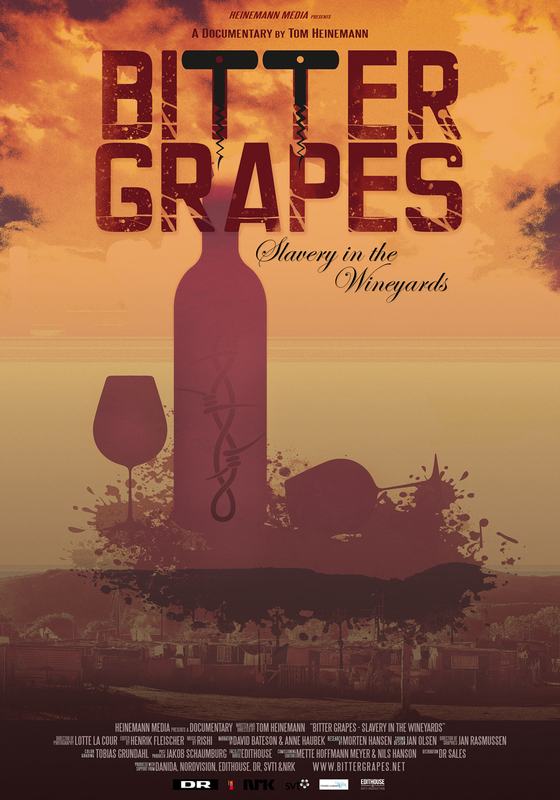 Besides the many critical points regarding the working and living conditions among the approximately 100,000 permanent farm workers struggling to survive in the South African vineyards, the documentary also describes how a rapidly growing number of migrant workers from countries such as Lesotho and Zimbabwe ended up at the bottom of the pyramid when it comes to the global race to outsource work to some of the poorest people in the world. Desperate people living in cardboard houses with families and children back home who are trying to survive on four dollars a day. Not an easy task, given that four dollars a day is half the absolute minimum wage in South Africa. But they have no choice and they have no voice, especially since only very few migrants are members of a union. Many don’t even have a work permit and most don’t even know if there is room for them on the back of the labour brokers truck or bakkie the next morning. Another alarming thing that the documentary unveiled was the gruesome heritage of the ”Dop-system,” where workers are paid in alcohol instead of money. This system was banned in 1960, but according to researchers at various South African universities and organizations, trying to highlight the negative consequences, the ”Dop-system” still exists today, just in other forms, where farmers allow alcohol-dependent workers to buy alcohol on credit. As a result, South Africa has one of the world’s highest levels of children born with FAS (Fetal Alcohol Syndrome), with more than 60,000 children born with severe brain damages annually. A condition they will have to live with for the rest of their lives. We met several of these children, both on the farms and in the crèches. One of them was Robyn. She is ten years old, but has the mental development of a child aged four or five. Luckily, she is now in good hands with a foster mother, but thousands of other children like her are not so lucky and face an uphill struggle in life. After having made headline news for weeks, and after the industry has done its best to ”shoot the messenger boy” by claiming that the documentary is ”biased” and ”one-sided,” both local and national governments intervened. Mid-November there were unannounced inspections at five of the farms that we visited in the documentary, and as a result of these inspections, all five farms were served legal notices in an attempt to clean up the mess and improve the conditions of the farm workers. The reason given for these notices was that housing were illegal, the official Health and Safety Act was violated, and that workers had not been trained or equipped with the necessary protective clothing when using hazardous pesticides that for many years have been totally banned in Scandinavia. One of the farms was also in breach of the national wage policy. The authorities have promised that many more farms will be inspected in the future. Is this a small light at the end of the tunnel for the farm workers? Will the wine industry and their respective bodies understand that Apartheid is gone and that they must treat the workers as they would like to be treated themselves? Will the Danish, Swedish and Norwegian state-owned retailers and supermarket chains understand that their ethical values and CSR-policies (Corporate Social Responsibility) are more than nice words on a piece of paper. In the management buzzword dictionary, this is referred to as to “walk the talk.” I would advise the South African wine industry to tie their shoes and start walking, and to understand that we will be hot on their heels for the duration of the journey. “Bitter Grapes” is written, directed and produced by Tom Heinemann for DR, SVT and NRK.